At the aforementioned entry, we also warned that the situation in the global economy actually resembles more of the time before the Great Depression than that before of the Black Monday in 1987. Worryingly, the same holds for the US equity markets. In fact, almost all of the developments that led to the Great Crash of 1929 are already visible in the US. We may thus be heading towards the worst asset market crash in 90 years. The 1929 crash marked the end of the ‘Roaring Twenties’. The era got its name from consumer and stock market booms driven by the automobile and building sectors. The gold standard and the neutralization of all gold purchases from abroad by the newly created central bank, Federal Reserve or Fed, controlled the consumer price inflation. Due to low inflation, Fed had only limited incentives to intervene on the speculation by increasing the short-term interest rates. The easy credit era was let to persist fueling the boom in the consumer durables, commercial property market, automobile industry and the stock markets. The tide switched in January 1928. The Fed decided that the boom had gone far enough and started to raise its discount rate and sell its holdings of government securities in effort to stem the speculation. But, rising money market rates made the brokers’ loans viable options for the bank loans because the former were mostly funded by the large balance sheets of corporations. The call loan rates were also clearly higher than the Fed discount rate, which meant that banks were able to borrow cheaply from the Fed and earn a nice margin on loans to investors. The higher interest rates set by Fed thus increased both the bank and non-bank funds available for stock market speculation. Contrary to the aim of the Fed, the financial conditions eased further and the speculation increased. The twenties kept on roaring. In 4 December 1928, President Coolidge had given a reassuring State of the Union speech and 1929 started with positive expectations. The stock market kept rising and the consumer boom continued. It was a common belief that earnings and dividends are growing because of the systematic industrial application of the science together with the development of modern management technologies and business mergers. 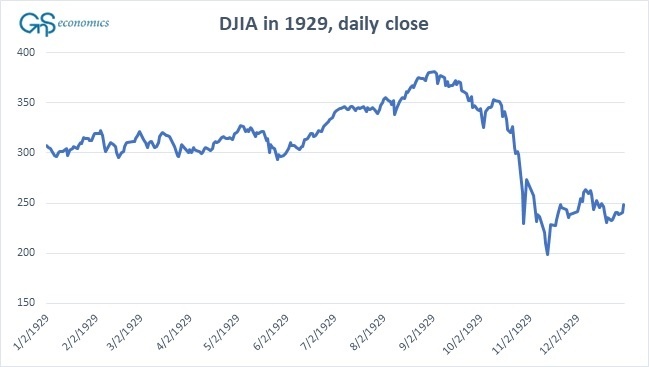 Still, the first half of 1929 was marked with increasing volatility. By the summer a dubious mood started to creep. The dividend growth was solid but the economy started to look mature. The first hints about the approaching recession arrived in July 1929 as the index of the industrial production of the Fed diminished. Mixed news and rising interest rates in the US and abroad warned of a looming recession. In September, the stock market started to drift downwards. The fear of a recession started to set in. On Thursday October 24, after a turbulent week, the prices hovered for all while at the start, but then fell rapidly and the stock ticker started to lag behind. The prices kept falling and the ticker fell further behind. The pace of the sell orders grew at an increasing rate and by eleven o’clock a ferocious selling had gripped the market. A few selected quotations given by the bond ticker showed that the that the current values were far below the now seriously lagging tape. Margin calls started to roll in and many investors were forced to liquidate their stock holdings. The increasing uncertainty made the investors even more scared and by eleven-thirty there was a sheer panic. The frenzy of selling could even be heard outside the New York Stock Exchange, where crowds gathered. At noon, the reporters learned that several notable bankers had gathered at the office of the J.P. Morgan & Company. At one thirty, the vice-president of the New York Stock Exchange (NYSE), Richard Whitney, appeared on the trading floor and started to make large purchases of variety of stocks (starting from the Steel post). This had a clear message: the bankers had stepped in. The effect was imminent. The fear eased and the stocks rallied. On Friday, the volume of trading was large, but the prices held up. During the weekend, there was a sense of relief. The disaster had been avoided and the actions of the bankers were celebrated. But then came Monday. On Monday, October 28, the market opened to uneasy tranquility which was quickly broken. The selling started, then accelerated, and by noon the market was in a full panic mode. The bankers gathered again but the savior was never seen on the floor. Heavy selling continued throughout the day, and the market melted down, with the DJIA closing down by almost 13 percentage points for the day. After the close, there was not a word from the bankers or from anyone else, for that matter. During the night, a panic spread through the nation. On Tuesday, October 29, the selling orders flooded the NYSE in the open. The prices plunged right from the start, feeding the panic. The sell orders from all over the country overwhelmed the ticker and sometimes even the traders. During the day, massive blocks of stocks were sold indicating that the ”big players” (banks, investment funds etc.) were liquidating. During the worst selling periods, there was a countless number of the selling orders but no buyers. This meant that, at times, the markets were in a complete free fall. There was a brief rally before the end of trading but despite this, the ”Black Tuesday” was one of the most brutal days at the NYSE with the DJIA falling by 11 % with heavy volumes. Within a week, DJIA had lost 29 % of its value. Are we in a time loop? The crash of 1929 marked the end of a long stock market boom fed by several years of easy credit. Because inflation was low for most of the 1920’s, Fed did not bother to curb the speculation by rising rates and when it did, the rise was too little too late. The signals for an upcoming recession broke the highly over-valued stock market in 1929. Actually, for example the dividends grew even in the last quarter of 1929 but the faith for the future of the market was broken and the investors panicked. Currently, we are in a situation where, according to several metrics, the stock market is the most over-valued in the history of the NYSE. The central banks, with their orthodox and unorthodox monetary policies, have fed the asset market mania for nine years now but, currently, they are in a tightening cycle. Moreover, the global economy is in a risk of a dramatic slowdown. This indicates that the main components of the crash of 1929: an over-valued stock market, a central bank tightening cycle (higher interest rates) and a slowing economy are almost all present in the US. We will thus soon know how well the history rhymes. Great Crash 1929“ by John K. Galbraith, “The stock market boom and crash of 1929 revisited” by Eugene White and on “Lessons from the 1930’s Great Depression” by Nicholas Crafts and Peter Fearon. Purchase our report explaining how companies, investors and households can prepare for the coming crash (€112 + VAT).